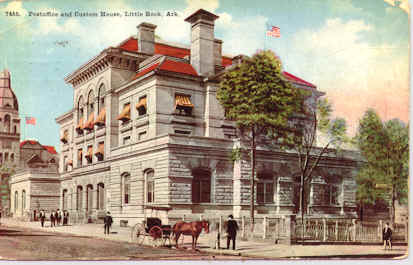 This building was originally constructed in 1881 as Little Rock's Courthouse and Post Office. The building was designed in a Renaissance Revival style by the Supervising Architect of the U.S. Treasury. It was constructed of stone and brick with a Cabin Creek Arkansas sandstone foundation, a red Missouri granite base and water table, and buff Berea Ohio sandstone upper stories. The roof was slate with an iron frame. The total construction cost was $224,542.87. Subsequent additions in 1897 and 1910 demonstrated the growing needs of Little Rock. The National Register of Historic Places in America listed the building in 1973. The building served as a Federal courthouse, post office, and customs house until 1932, when the Courts and Post Office moved to the present Courthouse on Capitol Avenue. Other Federal tenants occupied the building until 1975, when the building was declared surplus and transferred to the Arkansas Commemorative Commission. Three years later, the State transferred it to the University of Arkansas at Little Rock for use as a law school. The Law School occupied the building until the summer of 1992, when the law school moved to new facilities. The State of Arkansas subsequently conveyed the property back to the U.S. Government. Senator Dale Bumpers, former Senator David Pryor, former Congressman John Paul Hammerschmidt, and Chief District Judge Richard Arnold were responsible for getting Congressional approval for the building to become a permanent facility. 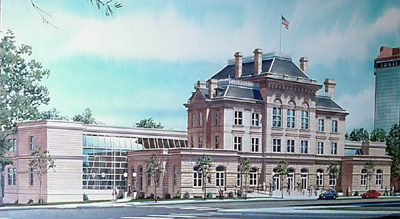 The design for the project was approved by Congress in October of 1992, and the construction for the project was approved in January 1994. Various significant spaces within the building have been restored to the grandeur of the time period within which they were constructed. The original 1881 courtroom with a 23-foot high decorative plaster ceiling and original wood wainscoting underwent extensive restoration painting including faux graining. An investigation of original paint colors found over 25 different Victorian colors just in this courtroom. The north courtroom was added in 1897 and features Tennessee gray marble with Tennessee pink marble borders. Restoration included faux marble veining to match the existing marble. This project added a third courtroom on the first floor of the existing building in what was originally the old post office workroom. Existing columns were incorporated into the walls of the courtroom. To meet today's needs of the bankruptcy court, additional square footage was needed. Through diligent design, sensitive to the historic building, two wings were constructed to the rear of the building. The wings consist of two floors and a basement. The basement provides secured parking, while the first and second floors house the offices for the clerk of the courts. The old Federal Building contained 60,660 square feet. The new wings increased the size of the building to 85,660 square feet. The architect for the project was Witsell, Evans & Rasco, P.A., of Little Rock, Arkansas. The construction contractor was CWR Construction, Inc., of North Little Rock, Arkansas. The construction management firm was 3D/International of Houston, Texas. Construction costs were approximately $13.2 million. Court personnel began moving into the facility on October 10, 1997.